For dressing, combine oil, sugar, vinegar, salt, pepper and flavoring packet from Ramen noodles. 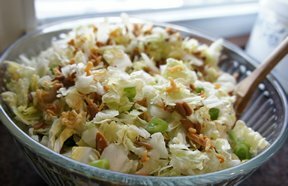 Shred 1/2 head green cabbage; combine with uncooked and crushed Ramen noodles. 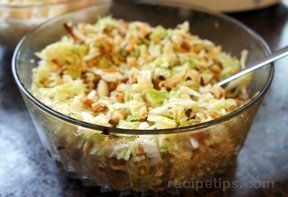 Pour dressing over all and mix together. 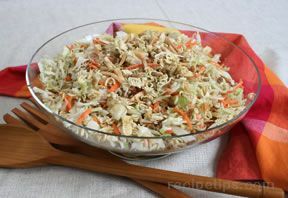 **OPTIONAL ADD-INS: chopped green onion tops, sesame seeds, sunflower seeds or slivered almonds on top. **NOTE: Oriental flavor is the best, but can use any flavor. The longer you let the salad sit, the softer the noodles get. Some like them crunchy, some like them soft.